My neighbors recently met with my good friend who is a real estate agent and discussed selling their house around the first of the year. They had a laundry list of things they felt they should do to the house before listing it. But as organized as they were, some things were not a priority. So, how much do you really need to do to prepare a house for sale? There are certain upgrades, repairs, and improvement that really should be done before listing if you want the most from the sale, but there may be things that are overkill. It also depends on the market, location, time of year and some other extenuating circumstances. If all these other variables are in your favor, you may not need to do much. But here are some serious things to correct before listing regardless of the market, unless you plan on selling as-is for a lower than market value price. Broken windows and cracked tiles. If the home looks like it just had a minor break-in, then fix those issues before listing. If you've been living with cracked tiles in the kitchen or bathroom it's time to get them replaced. You don't want buyers making their own laundry list of repairs before they even make an offer. Patch holes in walls, doors or window screens. Repaint the wall if necessary and make it look like there was never any damage to the wall or screen. This can be a spendy one but an important one that could be the kicker that sells the house. If your carpet has been through a few kids and several pets and looks like a daycare carpet, it's time for a replacement. My suggestion is to go middle of the road. I know you're selling but don't go cheap; buyers will be able to tell and it could be an indication of the quality of the rest of the house. You don't have to spend a fortune but a decent mid-priced carpet will work wonders - and do go with white. A nice frieze carpet with specks in it can hide a lot of flaws. Broken fences or outdoor features. If you have a water feature that is growing mold and moss, clean it up, repair it or get rid of it completely. Replace any broken fence slats and repaint or stain if necessary. Leaks, drips, and non-working pipes or bathroom fixtures need to be corrected before listing. All toilets, bathtubs and showers should work properly and all leaks fixed and damage from leaks repaired. Hardwood floors are suppose to have that "lived in" look so a few scratches and dents are usually nothing to worry about but if the floors are dingy or you just removed carpet over the floors, it may be time for a refinishing. Wood paneling is not the major eye-sore it once was and a good coat of paint could cover over that 70s look quite easily and inexpensively but ripping them all out can be very costly and you may not need to do it. Remove textured ceilings or popcorn ceilings. It's best not to touch these unless you really have to. Sometimes there could be asbestos in the ceiling, which needs to be professionally removed. If the ceiling is in good condition it's just best to leave it. Unless you're range only have one working burner and the dishwasher doesn't work anymore, you can probably leave the appliance alone unless the buyers ask for it in the inspection report. You can address those issues then. Again, unless the cabinets are missing hardware or have holes in them, you don't usually need to do much other than a good cleaning. Kitchen cabinets can collect grease and will need to be thoroughly cleaned but homeowners don't typically need to refinish, replace, or paint them. Granite counters are great, but they are not the only thing that sells a house. A good Formica or Corian counter top can last for years and if well maintained, does not need to be replaced when selling. If the roof is less than 10 years old, you probably don't need to replace it unless there has been damage or leaks. Buyers may want the roof replaced but don't do it unless you have to. 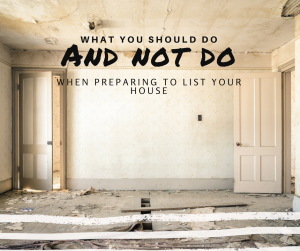 This is a snapshot of what to do and what not to do, but you also need to talk to your agent about the specifics of your house. Your agent will inform you of the market, the location, and the repairs you should be focusing on. Don't waste your time and money if you don't have to. Should I have multiple agents selling my house?